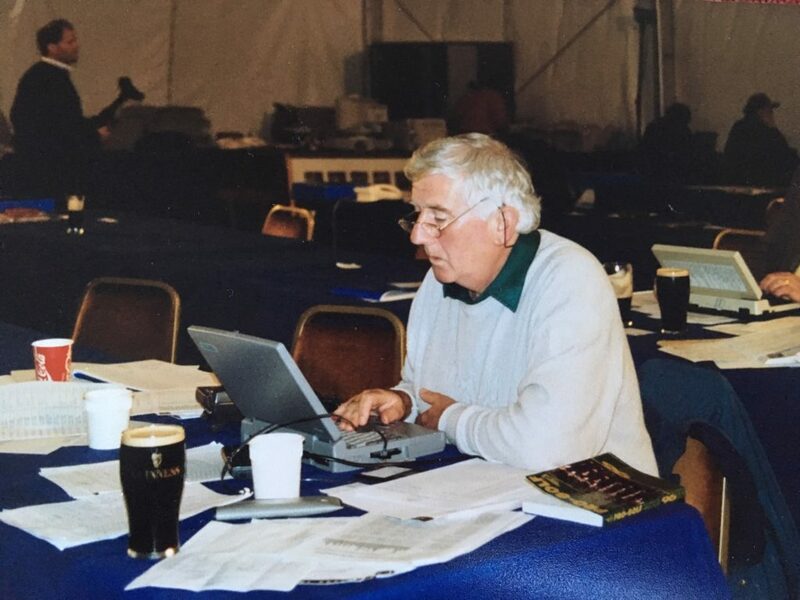 Tributes to Colm Smith (Born 13th July, 1940 – Passed Away 30th November, 2018; Member of the Association of Golf Writers 1971 to 2018). 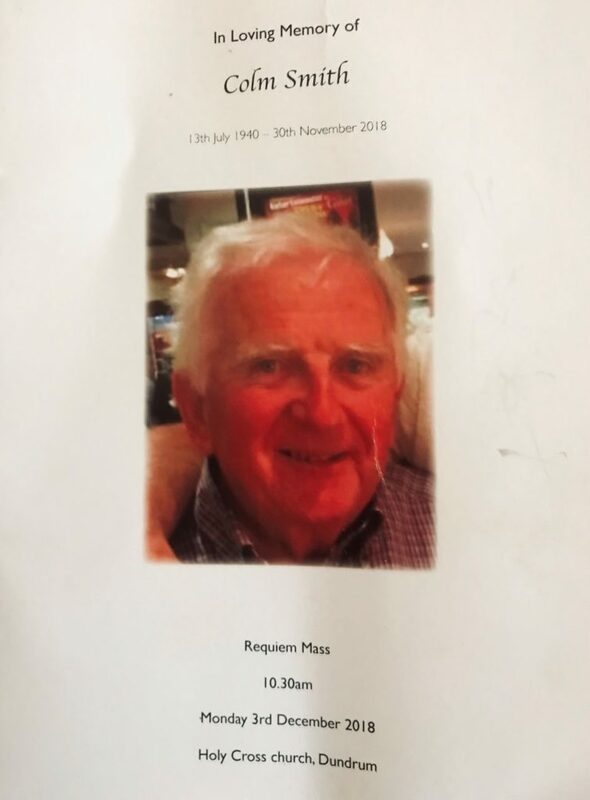 Colm’s funeral was significantly at ‘half-past’ 10 last Monday (December 3rd) at the Church of the Holy Cross in Dundrum and where five years earlier in 2013 his wife, Helen’s life was celebrated with a mass commencing also at ‘half-past’ 10. Very sad news. Mike McDonnell and I founded The Dregs, an off-shoot of the AGW, where we often sat, waited, drank to the dregs, waiting for golfers to appear. It was borne after a trip to Crans. If we were the founders, then Colm was our King. A giant of a man. Generous, funny, annoying, often late and never one to us one word when a thousand would do. I am 74 but after years in his company feel 174. How my liver is still working would puzzle even Stephen Hawkins. He was a joy, just like his wonderful wife. A trip to his house was called a blur. Will miss him terrible. He was Mr Fumble but many forget he was also a great journalist with a contact book to die (probably not the right word) to for. They say Gods rarely answer letters. He did mine. Sad news, Colm was a great guy and a robust drinking partner once work duties had been discharged. How old was he? Also, have you broken the news to Paddy Mearing? They were very close though probably not over the last few years. I can’t make the funeral, but is there a charity I can make a donation to? I was fortunate to get to know Colm in the days when I regularly reported on the Irish Open and the European Open. It was always a most pleasant two weeks when the events were back to back and this was due in no small part of Colm’s guidance and company. I was invited to Colm’s home in my favourite city of Dublin and I am smiling as I recall his jovial spirit, sense of fun and mischief, as well as the very healthy measures he poured! Colm and his charming and delightful wife Helen were the loveliest of hosts and any time spent in their company was richly rewarded with great memories. Not only was Colm wonderful company, he was a very knowledgeable man well equipped to discuss in depth and detail most subjects, often adding a fascinating insight when I sought his views on modern Irish history (1916 onwards) in an effort to feed my passion for all things Michael Collins and his legacy. I regret not having seen Colm in recent years, but he is very much in my thoughts at this sad time. I will never forget his kindnesses. My condolences for their loss to all his family and a man that I will always remember with much pleasure. Colm was a lovely man, a delightful colleague and someone I so much enjoyed knowing and being in his company. To all his family and I will miss his presence. So sad to hear about Colm. He was a kind-hearted man and a good friend for many years. We first met at the old Hennessy Cup at Ferndown nearly 40 years ago and he eventually got me a job at the Irish Independent. He played a great part in getting me ‘adopted’ by Irish players and contacts. Colm had a lovely relaxed way about him with a typically Irish wit. We had a lot of laughs and a good few drinks. He loved a good night out. I well remember swaying alongside him up on the stage, belting out karaoke, in an Irish newspaper writer’s quintet at Kiawah Island. He was part of the Irish golf writing trio of Smith, Mulqueen and Gilleece that can rightly be called: legends. Deep condolences from Sharon and me. 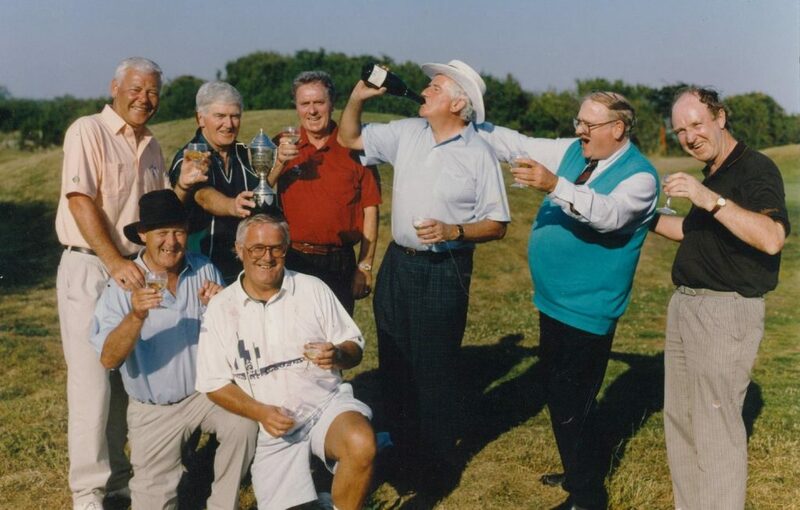 Colm Smith (with bottle) celebrating an Irish AGW Home International victory at the European Club – Pat Ruddy (blue pullover) demanding a glass. Colm Smith is gone from us after a long illness. As a contemporary of his, right from our first out-of-town marking together, I’ve been thinking of the special talent he brought to our craft. Few sports writers I’ve known had his gift for capturing the very essence of a competitive event. It was something I began to appreciate right from that colleges GAA match we covered down Longford way nearly 60 years ago. Little more than a decade later, he had advanced to the formidable task of reporting on rugby internationals for this newspaper, entailing the reporter’s nemesis of a tight, Saturday deadline. He was also the only Irish scribe to cover regular events on the European Tour for the Irish Independent, while the rest of us concentrated on the amateur scene here at home. Perhaps it was his gift as a decent tennis player which seemed to give Colm an edge. Either way, his insight into sporting endeavour was especially evident in his Irish Independent report of the historic US Masters triumph by Tiger Woods in 1997. I remember reading it with a mixture of admiration and envy. The only time we actually worked together was at the 1980 Open Championship at Muirfield, where Colm represented the Independent and I was his assistant, looking after the Evening Herald. Otherwise, we were rivals, and not always friendly ones. Still, there were memorable moments. Among these was a shared solution to the challenge of completing our reports on the 1989 Men’s Amateur Internationals at Ganton, in time to catch a flight home from Leeds-Bradford Airport. On explaining our difficulty to Mick McGinley, Paul’s father, he promptly produced the answer: a mobile phone. This was the original of the species, a big heavy lump which looked nothing like the implement it has since become. So, it was that Colm and I, replete with phone, grabbed a taxi and wrote and transmitted our reports from the back seat. We’d broken new ground in working conditions. I last saw him when he visited the Irish Open at Fota Island in 2014, when his strong, fit appearance totally belied the issues which lay beneath. I was a very ‘wet-behind-the-ears’ reporter who journeyed from Australia to jump into the deep end of covering the European Tour when I first shook hands with ‘Smithy’. What I will not forget is the support I received from Colm when I began filing to the Irish Independent. Colm pulled many strings to help set me on my way and when I look back now some 30-years ago with thanks and recalling vividly how he and Helen were always so warm, engaging and friendy. He was a rare individual who commanded a very respected position in a leading national newspaper but was never one to take himself too seriously. I liked that quality and perhaps it is why I always found myself enjoying his company so much. 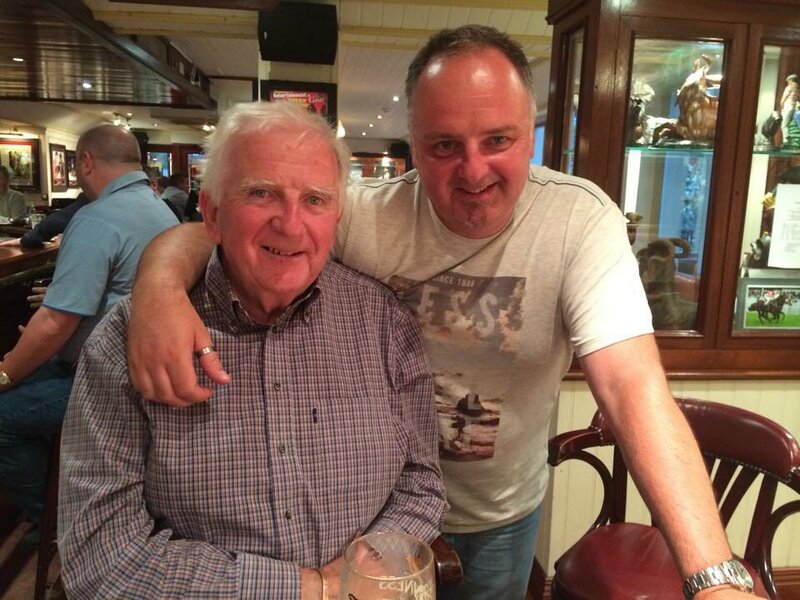 I last saw Colm when he attended the 2014 Irish Open at Fota Island and while he clearly looked frail and in poor health those memories of so many good times in his company were still strong and enriching. Colm Smith and his late wife Helen (Lennon) shared a great passion for sport and time spent in their company was always an absolute pleasure. Their lives revolved around sport and they were wonderful hosts at their home in the south Dublin suburb of Goatstown. In quiet moments together, over a glass of wine, they would have enjoyed reminiscing about their respective careers in sport. Helen was an international tennis player. She competed against some of the biggest names in tennis in Federations Cup matches, including Martina Navratilova, Billie Jean King, Evonne Goolagong, Virginia Wade and Sue Barker. Helen went on to become a prominent tennis coach in Ireland. Sadly, she passed away after a short illness in April 2013, shortly after her retirement. Colm followed in his father’s footsteps when he joined the staff of the Irish Independent in 1958. During the early years of his career he covered everything from Currach racing in Galway Bay to Polo in the Phoenix Park, from Chess to Cricket to Lacrosse and, just as an aside, livestock sales in the RDS in Dublin! Smithy’s career in sports journalism spanned 43 years, during which time he reported on Wimbledon, Lions tours, Major Championships, Ryder Cups and a whole host of other prestigious sporting events. He covered Wimbledon from 1961 to 1973 and was privileged to see Rod Laver win each of his four titles on the Centre Court (1961, 1962, 1968 and 1969). 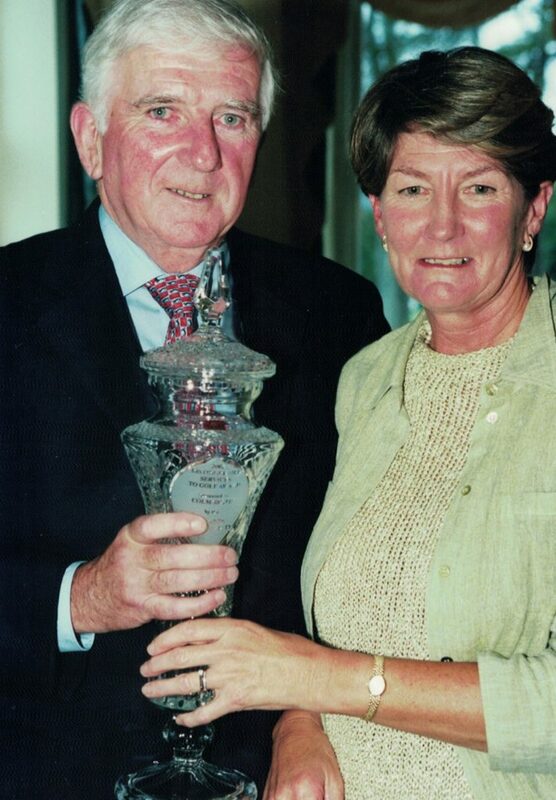 Colm and his wife, Helen at the Powerscourt GC awards night in 2002. Colm covered the historic Lions tour of South Africa in 1974 and Ireland’s eight-match tour of Australia in 1979. He harboured great memories from the 1974 Lions tour, which was led by Willie John McBride. “We spent three months in South Africa – 22 matches, 21 wins, one draw. The Test Series was won 3-0 with the last match drawn. It was the last of the really long tours. It was a rare piece of history and a cultural life experience,” he recalled. Colm spent 31 years travelling the world as a golf correspondent. He reported on The Open Championship for the first time in 1975, and in 1987 attended his first Masters at Augusta and first US Open at the Olympic Club in San Francisco. He returned to Augusta every year except one up to his retirement in 2001. He first covered the Ryder Cup matches at Muirfield in 1973, the last time two of the game’s greats played together in the match…Arnold Palmer and Jack Nicklaus. Colm’s next Ryder Cup assignment was at The Greenbrier in West Virginia in 1979, the first time a European team participated against the Americans. From then until 2002 he missed only the 1983 Ryder Cup matches. Colm’s career in sports journalism was celebrated at the Legends Golf Society’s 11th annual International Awards event in Dublin in 2002. He shared centre stage with four-time Ryder Cup player Eamonn Darcy, who was presented with the society’s Legends in Golf award. Colm received a special award for Distinguished Services to Golf. He joined a roll call of society honourees that included Harry Bradshaw, Peter Alliss, Peter Dobereiner, Joe Carr, Christy O’Connor Snr, John Jacobs, Peter Thomson, Michael Bonallack, Tony Gray, Bob Torrance, Peter McEvoy, Doug Sanders and Mark McCormack. In his acceptance speech Colm talked about many great moments, great events and iconic venues that he visited over the years. Wimbledon, Augusta National, Cardiff Arms Park and Ellis Park in Johannesburg were among his favourite sporting venues. He was privileged to be at Augusta in 2001 when Tiger Woods became the first golfer to hold all four men’s professional major titles at the same time (but not in the same calendar year). And he spoke about his great admiration for Seve, as a golfer and as a person. It was fitting that a special moment involving Seve marked Colm’s retirement in 2001. At a gathering of media and tour colleagues, Seve stepped forward to make a special presentation to his Irish friend. We all have our favourite Smithy stories. I participated in the AGW Home Internationals on five consecutive occasions in the early noughties, when Colm was the Irish team captain. Colm’s style of captaincy was designed to bring out the best in Irish team members, on and off the golf course. It was all about blood, sweat and beers! We won our Foursomes match 4&3 early the next morning despite a less than ideal start. On the first tee Smithy made it clear that losing was not an option as Ireland were defending champions. He duly proceeded to carve our opening drive into the Welsh countryside and, instead of being sheepish, gave me an icy stare. The Bald Eagle reloaded, took a few deep breaths and sent an Exocet off in the same direction, never to be seen again. We dug deep and, copious bottles of Spring water later, somehow managed to outgun our bemused opponents. And another great night was had by all! Colm Smith. Colleague. Friend. Legend. Farewell Smithy. The sands of time will never wash away a treasure chest of happy memories. 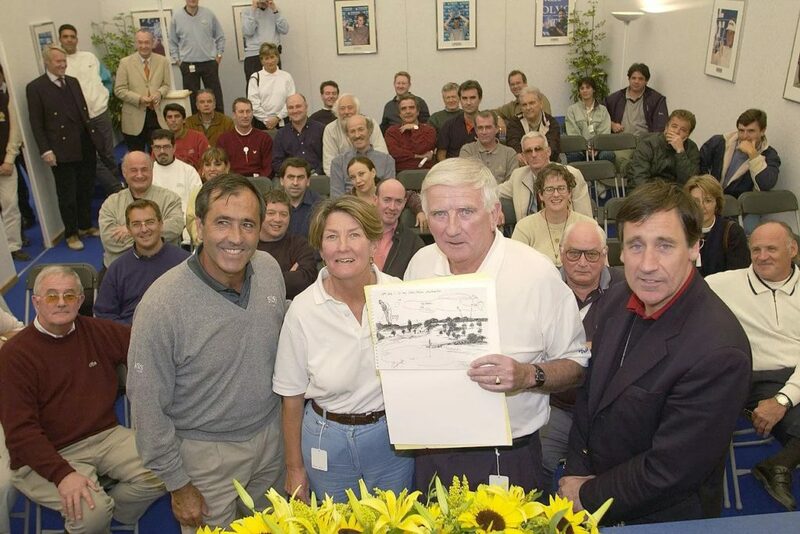 Seve presents Colm with a retirement gift during the 2001 Volvo Masters. Colm’s wife, Helen present along with then AGW Chairman, John Hopkins. How many current and past AGW members can you count – 18? The sun was not yet past the yardarm and I politely replied to Colm that I’d be delighted to join him after work. That was never going to happen, not with Smithy. By lunch-hour, myself and Vincent Hogan, another recruit from Burgh Quay, were ensconced with our new colleagues in the ‘Bachelor Inn’ over the finest of pints. It was evident that the ‘Indo’ sports reporters were accustomed to a tipple or two between phone calls and tapping out copy. Tom Cryan, a very fine golf writer, but an even finer boxing one, was present as was Noel Dunne, the football correspondent who also dabbled on the golf circuit. Soon, the sub-editors on the ‘Evening Herald’ joined us after finishing their shifts and by tea-time, the ‘Batch’ was hopping in a fug of smoke, stout and sociability. I’ve a vague recollection of being poured on to a bus at some point and then wall-banging my home. Still, I’d learnt a lesson about my new colleagues, chiefly Smithy. One, they looked out for their own and two, you needed hollow legs to go drinking with them. On that score, I was never better than an 18-handicapper. Smithy, in form, could play off scratch. On the golf beat, Smithy was a generous companion, helpful with contact numbers and introductions. Curiously, at the Irish Open, he seemed to spend less time in the press tent than others, yet his copy still got through and always read fresh and vivid. Smithy left the Indo in 2003, four years before me but at his funeral in Dundrum on Monday, it was like ‘Room 88’ all over again. Smithy cared for people, and he cared for nature too, as his son John illustrated in a lovely story at the funeral. Many years ago, Colm heard a noise behind the chimney at his home in Goatstown. He twigged that a bird had got stuck in the flue. Rather than ring the RSPCA, Colm fetched a hammer and proceeded to smash a hole in the breast, brick by brick. He retrieved the stricken bird, checked that it was ok, and then set it free. There were former colleagues, some of them well into their 80s, who turned up to salute one of the genuinely good guys of Irish sports journalism. Smithy didn’t do schmaltz, but he’d have appreciated the huge gallery who gave him the send-off. Among the AGW golf writers present were Dermot Gilleece, Charlie Mulqueen, John Redmond, Michael McDonnell, Philip Reid and Brian Keogh and with Greg Allen and Denis Kirwan attending the removal the night before. Everyone of us had, at some stage, been touched by the geniality of Smithy. Colm Smith (Far right back row) with the AGW at a Home Internationals match. Colm Smith will be badly missed. He loved his job covering golf but enjoyed playing it much more. He may not have played off scratch but he was a single figure man at the bar where he enjoyed a pint or two with the lads and always drank responsibly. He was fun to be with. He was always the same. You could depend on him. Colm’s love of life was infectious and we who knew and worked with him all benefitted from his Irish charm. Others knew him rather better than I did but I always knew him as one of the good guys. I am happy our paths crossed from time to time in a work capacity as well as on social occasions. He was honest, reliable and above all hugely agreeable and always amiable. He was a true ambassador for the Association and for the game of golf. SO sad to learn of dear Colm’s death and perhaps even sadder to know that the last few years have been such a trial for him and for those who loved him. 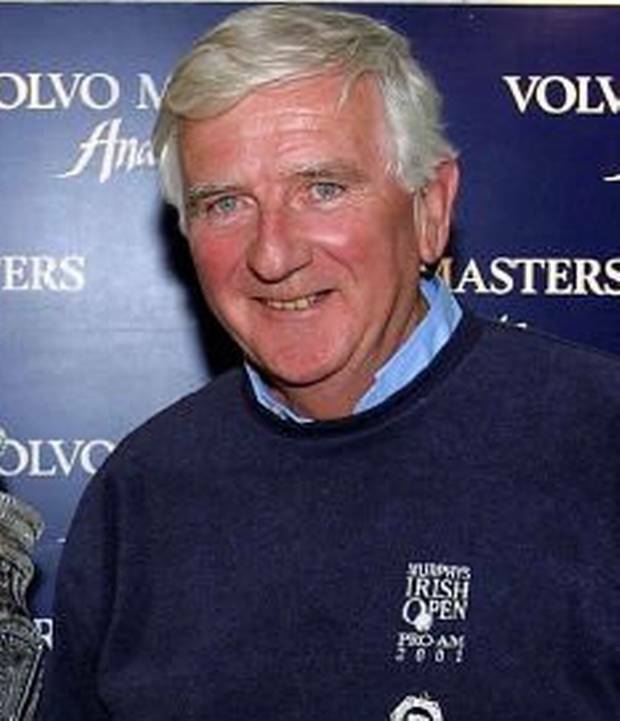 He was, as everyone who knows him already realises, a larger than life character, a seeker after fun and diversion, a sensitive friend and an outstanding journalist whose devotion to, and knowledge of, the game of golf and particularly Irish golf had few, if any, peers. He and his wife Helen – an outstanding, international class sportswoman herself as well as a charming and witty companion over so many years – have both now been taken from us far too soon. The warm memories linger on however. Colm, occasionally incomprehensible in sobriety, was totally incomprehensible to me when a few drinks had been taken but, for one reason or another, we rarely stopped laughing. May he rest in peace, hopefully in the caring company of Helen. My condolences to all his family and many, many friends. Colm Smith was a big man in many ways An imposing figure with a big personality and a big heart to match. 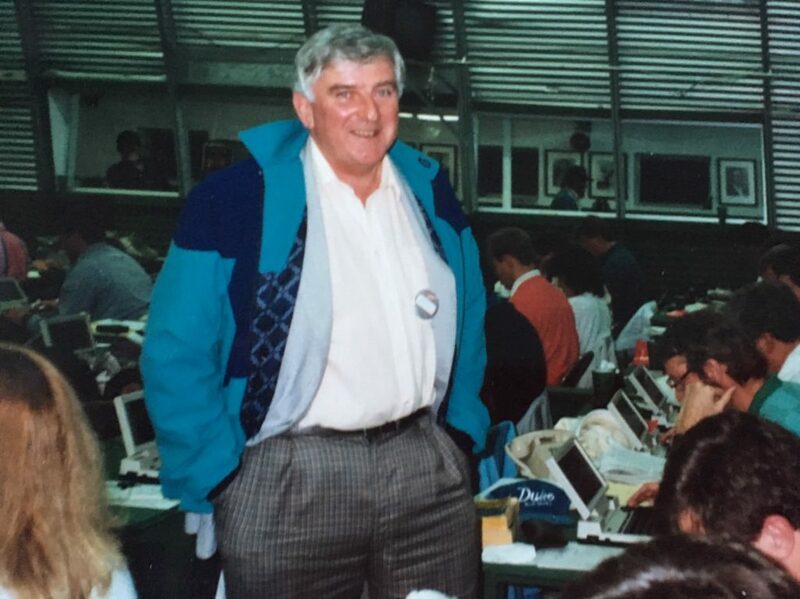 I rank Colm alongside such trusted colleagues as Michael McDonnell, Tony Adamson, Bill Elliott, and the late Michael Williams and Ronnie Wills who did so much to make me feel welcome and valued in the Press Tent (now known as Media Centre. He was a fine writer on golf his other love was rugby and he could even make me, a committed Association Football man, enthusiastic about the oval ball game. He was also a fascinating raconteur on many other subjects and I can recall spending many happy hours in his company at one of the meetings of that only slightly reputable bunch called The Dregs. Colm Smith at a 1996 European Tour event – Note the pints of Guinness front and behind. I knew Colm for over 50 years as a colleague and a family friend. I proposed him for AGW membership and he was largely instrumental in establishing our Home Internationals. He had an impish sense of humour. Once when we were in O’Connell Street , Dublin, I asked: “Which side of the River Liffey are we on”? He replied: “This side.” Very droll. He had a great and enduring rapporte with Irish golfers at all levels. But above all, he was good company. After one boisterous evening in Dublin – where else?- I asked:” What time did we turn in last night?” He thought for a moment:” About half past” Pause: “But it could have been a quarter to!” I remember him and smile. Thanks for that and the memories big man. While a move to a desk job and subsequent liquidation of my newspaper group took us on opposite social and professional paths from the mid 1990s, the earlier 25 years of covering a variety of sporting assignments for our rival publications forged a friendship that will forever have fond recall. Sharing an early life that took account of reporting on hare coursing, tennis, Gaelic games, soccer and rugby, it was not until we “graduated” to full time golf writing that a special bond was forged. Two stools at the 19th hole at the conclusion of the day’s play painted a familiar picture of two supposed rivals sharing so much that was good over 25 years of life on tour inside and outside the fairway ropes. “Them were the days!”. All my days I will remember the great times spent in the company of Smithy. Life was always fun, often helped along the way with the occasional adult beverage. Augusta nights, Open Championships but, especially, the AGW Home Internationals that would not have been the same without his large, genial presence. He was a giant of journalism and a Colossus of good humour. I was extremely saddened to hear of the death of Colm, a man who burnt the candle factory at both ends. Whenever he was asked, after a previous night’s festivities, what time he had retired to bed he would reply: “half past”. I advise everybody to adopt this brilliant strategy. What time was his funeral? Half past. Colm Smith within the Media Centre at Augusta National. I knew of Colm before I knew him. I was aware he had covered the all-conquering 1974 Lions tour of South Africa with Terry O’Connor of the Daily Mail, Chris Lander, the Mirror, and John Reason, Daily Telegraph among others. When Colm and I got to know one another, which would have been after the autumn of 1980 when I switched from writing about rugby to covering golf, he and I had numerous conversations about rugby in general and that tour in particular. I sensed that that tour was something of a milestone in his journalistic life and that he loved rugby as much if not more than golf, though I may be wrong. We had conversations about many other things, too, because you just did with Colm. You weren’t always sure what the conversations were about when you tried to remember them afterwards. Indeed, you often were not sure what they were about when they were going on. He was very keen on the Association of Golf Writers, proud of its history and its achievements for its members. If he took me to task once with the words “Hoppy, I’m very disappointed in you” because he perceived I, as chairman, had failed to do something, the right thing, for the AGW then he did so many times. He was particularly keen that the AGW badge should not be diminished in importance. One other Colm Smith idiosyncrasy has stayed with me. When you asked him what time he had gone to bed the night before, a perfectly normal question of a very sociable man last seen with a drink in his hands in the early hours of a morning, any morning, he had a standard reply. “Half past” he would say, looking you in the eye. PAUL GALLAGHER (Irish Times) – Article on Irish Golfer Magazine website. I enjoyed many occasions in the company of ‘Smithy’ and will never forget his zest for life. A character full of mischief, full of life in a life lived to the full. Colm Smith, they threw the mould away when they made you. 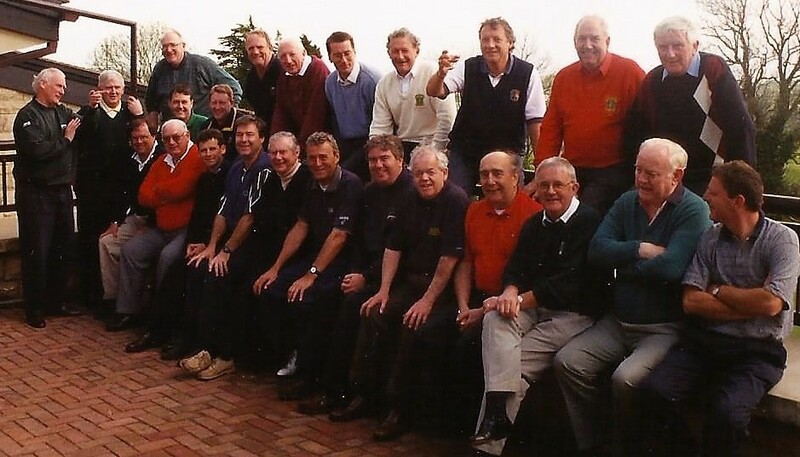 My most vivid memories of ‘Smithy’ involved the Golf Writers’ Home Internationals; annual matches between the home nations where golf played a secondary role amidst the banter and camaraderie at the bar. Smithy and the likes of Wales’ Peter Corrigan or Scotland’s Martin Dempster were the glue that pulled together this most social of annual gatherings. I was a relative whippersnapper when making my introduction to the ‘Ireland Team’ over 15 years ago. Smithy took the likes of me under his wing. The ability to wind up the opposition and be last man standing of an evening was just as important as any golfing ability. The following morning, I not only missed breakfast and my tee time but was later informed I was so far gone I had slept through a hotel fire alarm not to mention countless calls from my skipper who had to get housekeeping to let him into my room. For years I’d formed a fine playing partnership with The Sun’s Sports Editor Cathal Dervan and needless to say he drove the buggy that morning. When starting out on this writing career, those of us wet behind the ears got to hear legendary stories, yarns about characters like Colm, Charlie Mulqueen or Dermot Gilleece. These guys filled media centres alongside the likes of Philip Reid, Greg Allen, Brian Keogh, Karl MacGinty, Liam Kelly and many others. A real band of brothers. We were from the internet brigade but we were fortunate to have caught the tail end of a glorious sports writing era from which Smithy was very much a part. Smithy knew how to burn the candle at both ends but he was much more than a social butterfly. He was a seriously talented writer who understood his craft. 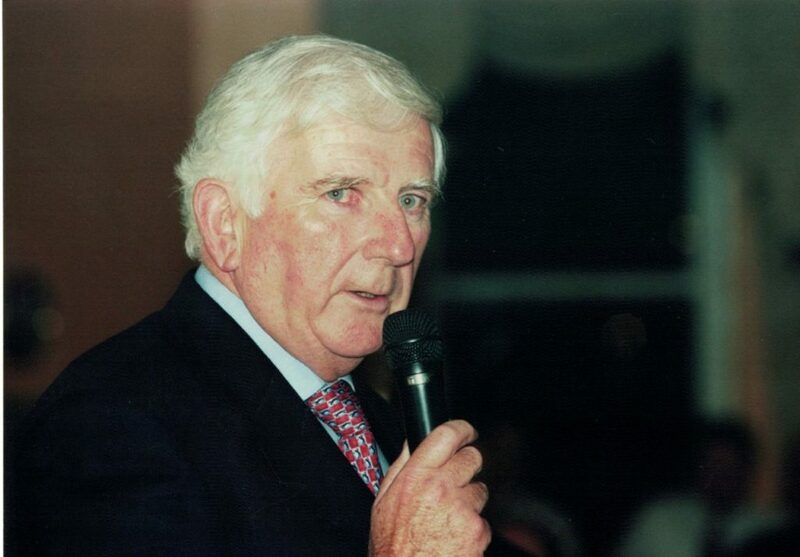 His work filled pages of the Irish Independent for years as the paper’s Golf and Rugby Correspondent. He had the respect of the players and teams he interviewed and was held in high regard amongst his peers. He possessed sporting talent in his own right too, especially with a squash racquet in hand. Sport was in he and his late wife Helen’s blood. Smithy suffered poor health in recent years and deprived those around him of his undoubted wit and charm. Other friends and colleagues were much closer to Smithy, but I’ll never forget the welcome and warmth he always showed when we met. Smithy had a real zest for life and that’s how I will remember him. I first met Colm at the inaugural AGW Home Internationals at St Margaret’s Golf Club outside Dublin. It was my first visit to Ireland and I will never forget the Scottish captain, Alister Nicol, saying he feared the worst for me when I was left propping up the bar at our airport hotel in the company of Irish skipper Smithy, his Welsh counterpart Peter Corrigan and Tim Glover. He was right as I was out of my league in that company – at the time – and I paid a heavy price the following day. In fact, that was the day that led to a toilet being christened ‘Dempster’s Lounge’ by the club when we returned the following year due to the fact I was in there for hours due to the fact I had such a stinking hangover. Undeterred, I spent many more enjoyable nights at the bar with Smithy over the years and always cherished those occasions. Indeed, the likes of Colm and Peter played a big part in the social person I have enjoyed becoming and, consequently, I am always encouraging my two daughters to be equally sociable in their lives. Both Colm and Helen became good friends and I will never forget how they both went out of their way to ensure that a group my wife and I were part of found a nice play to stay during a visit to Dublin, meeting us at the airport, taking us there and providing all the information we needed to enjoy a memorable visit to the city. Like many other AGW members I have been privileged to come across over the years, he may be gone but will never be forgotten. “So sorry to hear of the passing of Colm Smith.